The Employee Reprimand Notice Letter is used to inform an employee that they are being reprimanded for something such as misconduct, poor performance, repeated absences, etc. using the product for over three years now. I got it due to the pre-made forms and contracts (there are tons of them). I use my logo and info and the software does the rest! Amazingly easy to use! The new version is awesome, and even easier to use." This Employee Reprimand Notice Letter is included in editable Word format that can be customized in Word or by using the included Wizard software. You are receiving this notice of official reprimand because of Insert reason for reprimand, such as misconduct, poor performance, or repeated absences, which is a violation of our company's standard, which states statement of company policy. This reprimand will be recorded in your employee file. If the violation mentioned above happens again, you could be demoted or your employment here could be terminated. If you have any questions, please contact the Human Resources Manager. 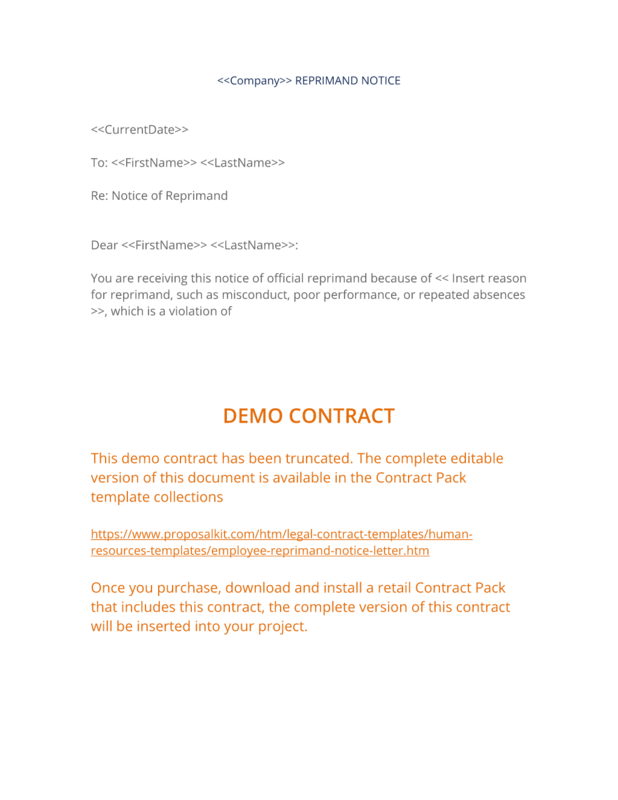 The complete Employee Reprimand Notice Letter - with the actual formatting and layout - is available in this Contract Pack.